The repackaged and enhanced collection from Scotland’s leading independent family owned distiller truly reflects the malts’ outstanding sherry credentials. 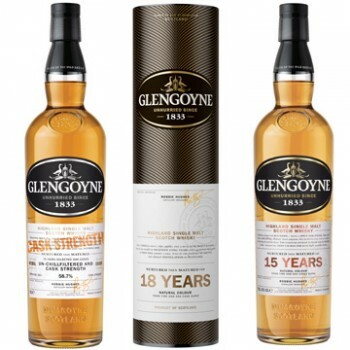 In addition to the 10yo, 12yo and 21yo, Glengoyne has introduced three new malts to complete the line-up – a new premium Glengoyne 15 year old malt, a new formidable cask strength expression to replace the current 12 year old cask strength and a stunning new world-class 18 year old replacing the 17yo. Each new expression has been crafted from some of the finest sherry casks within Glengoyne’s warehouses. Commenting on the new range, Iain Weir, Marketing Director for Ian Macleod Distillers said: “True to the brand, we’ve been working on the enhancement of the Glengoyne range over a long period of time. At a time when the industry is squeezing every last litre out of their distilleries, we hold true to our craft. By distilling slower than anyone else in Scotland, we can genuinely claim that Glengoyne is ‘Worth the Wait’. The Glengoyne Distillery – highly regarded as Scotland’s most beautiful distillery in Dumgoyne near Loch Lomond – runs its stills slower than any other distillery. Unlike most other single malt whiskies, it dries the malted barley using only warm air resulting in this extremely subtle yet complex malt where all the delicate flavours are freely expressed. Finally the whisky completes its journey to the bottle in some of the finest Oloroso sherry casks within the industry. Fittingly, it took over 18 months to create the new look range, which encapsulates the established values of Glengoyne: caring nature, enduring spirit and pioneering independence. ‘Caring nature’ draws on craft elements such as barley dried by air, and oak which waits six years before it is ready to make its home in Glengoyne’s warehouses; ‘enduring spirit’ refers to the handcrafted skills passed down from seasoned hand to new apprentice. And, ‘pioneering independence’ underlines Glengoyne’s history of setting trends, independent ownership and strength in convictions. The new range has been repackaged by Glasgow-based agency Good Creative to focus on the brand’s strengths and unique history with a strapline ‘Worth the Wait’ reinforcing the link between handcrafted expertise, taste and unique distillation process. The bottle label and cartons also highlight the distillery’s heritage and original Gaelic name ‘Glen Guin’ (Glen of the Wild Geese) with a hand-drawn brand crest depicting two wild geese. The Glengoyne range launch will be rolled out globally over the next few months and will be supported by a new dedicated website and advertising campaign. For more information, please visit www.glengoyne.com.